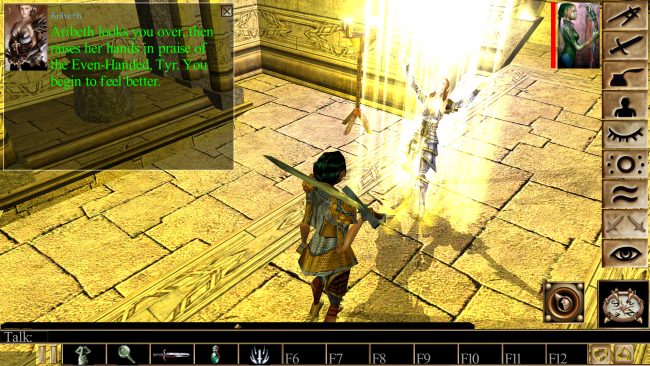 Neverwinter Nights Enhanced Edition Comes to Android! Neverwinter Nights (NWN) is a 2002 PC role-playing game (RPG) developed by Bioware as the follow-up to their classic Baldur’s Gate II: Shadows of Amn, which is regarded as one of the greatest games ever made. NWN was both a commercial and critical success, spawning two large expansions and a later series of ‘premium modules’ that offered even more gameplay at a bargain price. On top of this, NWN offered incredibly rich tools for developing persistent worlds for story-based multiplayer experiences that are still active more than fifteen years later. Earlier this year Beamdog released the PC and Mac versions of Neverwinter Nights: Enhanced Edition, continuing the series that includes both Baldur’s Gate games, Icewind Dale and Planescape Torment. All of those games have gotten iOS and Android mobile ports, so it was hoped the same would happen for NWN. And a couple of weeks ago Beamdog sent out an email that they had released a ‘beta’ on the Google Play store. This allowed you to pay $9.99 to get in on the game while it was still in pre-release testing. I wanted to wait to report on it until I had the chance to play a decent chunk of the game, and will include my impressions after the news. Neverwinter Nights: Expanded Edition has now been officially released to the public. Neverwinter Nights: Enhanced Edition is now available on Android! Experience all the playable content of Neverwinter Nights: Enhanced Edition like never before! • All the playable content of Neverwinter Nights: Enhanced Edition. o Kingmaker, ShadowGuard, and Witch’s Wake will be made available as free downloads for NWN:EE owners at launch. • Mobile Play: A new virtual joystick and context sensitive button makes gameplay easy. • Improved Display: Featuring a new re-engineered UI for tablet and phone play. Portrait, combat bar, inventory, and other UI elements adjust in size based on device resolution and can be scaled to your liking. • Backwards Compatibility: Works with save games, modules, and mods from the original Neverwinter Nights. It’s time to take this classic Dungeons & Dragons game with you on the go. Grab it on Google Play today! Head to Google Play to grab your copy of Neverwinter Nights and begin your epic adventure! I am playing NWN:EE on the recently released Samsung Galaxy Tab S4, which is the current ‘Android tablet flagship’ in terms of specs and performance. At this point I am just about to complete Chapter 1 of the ‘Original Campaign’ – so really these are more than just ‘first impressions’, as Chapter 1 usually takes me about 20-30 hours to complete, as I tend to be a completist and do all the side-quests, henchman quests, and other optional areas. So instead this is more of a ‘review based on ~30 hours of gameplay’. So far everything that I have tried has worked perfectly – Neverwinter Nights features a decent sized tutorial area followed by a large first chapter that really has it all: a central hub with key quest-giver, multiple areas to explore featuring a variety of enemies and challenging battles, great loot to discover that will make you more powerful, a diverse cast of characters and henchmen with fully drawn personalities and motivations, and the ability to develop a rich character based on the Dungeons and Dragons universe. I also took some time to start new games in the two main expansion packs – Shadows of Undrentide and Hordes of the Underdark. Hordes is perhaps my favorite module, you start out as a powerful character and quickly advance into the higher epic levels – allowing for the first time to truly wield the power promised by D&D. Both of these expansions performed well, and I am excited to revisit those once I complete the main game. There are also other modules that are available for download or purchase, rounding out most of the ‘Premium Module’ program, and all at a reasonable cost (or free!). The reality is that a game designed for the PC will never play better on anything else. That is true here – but I was impressed at how playable the game was on the tablet. The basic system involves a fairly common ‘dual virtual joystick’ approach, with the left side of the screen used for movement and the right for camera control. Pinch-zoom controls the camera distance from your character, and you can tap anywhere on the screen to move to that place or interact with objects (doors, storage, characters). The UI (user interface) adapts from the PC version by having a persistent menu available on the right side of the screen, as well as the usual quick-slot menu at the bottom of the screen. One of my favorite things is the big pause button next to the quick-slots. This allows you to pause the game easily to issue commands and rotate the camera to assess the situation. It is something integral to the PC game that was well done on the port. Also, the PC game depends heavily on right-clicking pretty much everything – which is done in the Android port by long-pressing objects. Want to disable a trap? Long press to bring up the menu and select the disarm trap icon. It takes longer than a right-click or an iOS force touch, but it works perfectly and quickly became a normal action for me. Finally, one thing that was missing in the initial release but added later was support for using the keyboard and pen/mouse to control your character. I am using the Samsung Galaxy Tab S4 with the keyboard folio cover. So I always have my tablet folded out with the keyboard ready to go – which made having to use the screen controls for everything a bit weird. Fortunately, now I can use WASD to simultaneously move my character and rotate the camera (I use the ‘Chase Cam’ setting), press the PC hotkeys to access game and character settings, and interact with the environment. 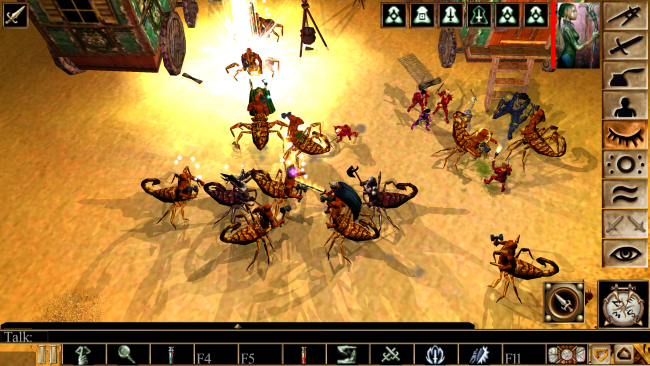 While Neverwinter Nights didn’t have visuals to compare with contemporary shooters and action games, it was broadly praised for excellent graphics – particularly once large-scale battles started with spells flying around and multiple characters taking up tactical positions around the battlefield. 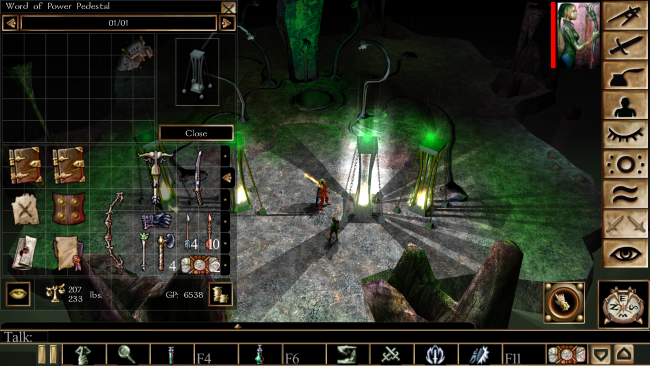 One of the goals of the Enhanced Edition program from Beamdog was to clean up textures and models, making things look great on modern high resolution widescreen displays. The goal was not to make the games look like a brand new 2018 AAA release – this was disappointing to some, but is a reality that provides important context for assessing the game. I have played NWN, the expansions, and premium modules multiple times through the years, using the original CD release, later DVD and digital releases of the Diamond Edition that collected everything together. I have not had issues with the graphics or performance of the game across a variety of Mac and PC laptops, but had begun to notice the issues with widescreen compatibility and lower resolution textures – so I was ready when Beamdog announced the Enhanced Edition! The Android version looks and performs pretty much identically to the Mac version on my 12″ Macbook – and that is excellent! I never noticed any significant difference such as limiting numbers of on-screen items or experienced lag when casting graphically intensive spells. Overall – I am very impressed and satisfied with what Beamdog has accomplished. When I first installed the NWN app and got started, it very much felt like a beta – I had stuttering performance at times and the game crashed repeatedly while interacting with tutorial characters in the initial area. As soon as the next update was released, all of those problems went away and I have not had a single crash or performance issue. Back in 2002 I initially bought Neverwinter Nights because I was anticipating the release of Star Wars: Knights of the Old Republic and was told that NWN would be a great introduction to the mechanics and systems involved in Bioware games … but it quickly became one of my favorite games of all time. You can measure my love by how many times I have run through the total 200+ hours of the game and its expansions and modules over the years, both using new character classes and types as well as just replaying using my trusty Sorcerer or Paladin. Beamdog’s release of Neverwinter Nights: Enhanced Edition brings another classic piece of PC gaming history to a mobile platform, and they did it about as well as possible. Performance, graphics, controls, compatibility and the overall experience are all wonderfully realized, and you never feel like you are getting an inferior experience. While I will always recommend playing games for the first time on their intended platform, I believe that anyone checking out NWN on an Android tablet is in for an incredible adventure!